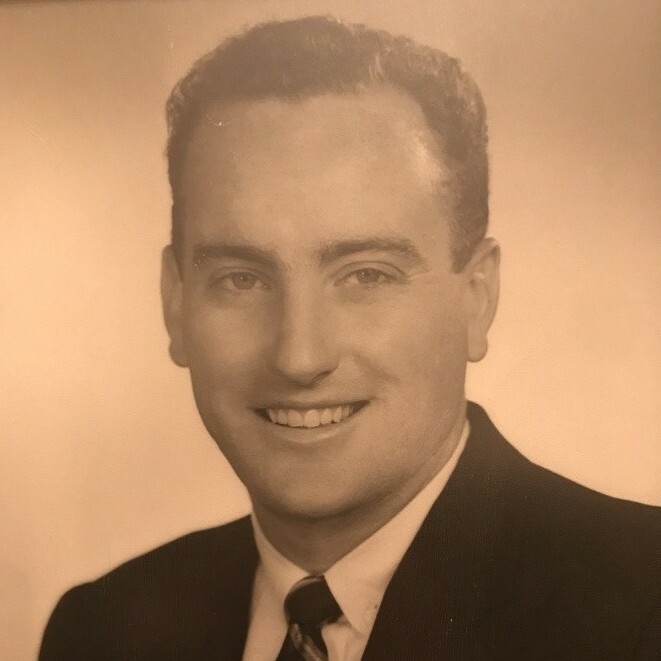 Barry Joseph McManus, beloved husband, father, grandfather and brother passed away at home on March 19, 2018. He leaves behind his best friend and wife of 52 years, Heather Huested McManus, his adoring children, Meegan Shevlin (1967-2016) husband Brian Shevlin, Marni McManus husband Brian Tironi, Barry J. McManus wife, Christi McManus and grandchildren Erin & Kyle Shevlin, Morgan & Mia McManus and Max & Jameson Tironi and his brother William A. McManus III. Barry was born September 3, 1930 in Astoria, Queens to Margaret and William A. McManus Jr. He attended Bishop Loughlin High School in Brooklyn, Fordham University for his undergraduate degree and Columbia University for his Master’s degree in Education. He was in the Coast Guard during the Korean War and was stationed in the South Pacific on Ichi Binari Island. He was discharged on November 9, 1953. He and Heather were married April 2, 1966 and remained happily married until the day he died. Soon after they married they moved to Brazil where he was a principal of the American School in Sao Paolo and she was a kindergarten teacher. In addition to becoming new parents to Meegan while in Brazil, they enjoyed exploring South America and brought back several exotic animals as “souvenirs”. They returned to the states and lived on Sunset Drive in Endwell, NY which could have been a theme song for their lives. They lived in Endwell for 5 years and added to their family with their second daughter, Marni, and although were only there a short period they made some lifelong friends. They moved to Setauket, NY in 1974 and have remained in the area ever since. Their son, Barry, was born the following year and their family was complete. Barry’s priorities were always his family, his faith and his friends. With a keen sense of humor and an inclination for dramatic humor he kept everyone laughing around him. The McManus’ hosted many parties at their house on Strong’s Neck over the years, Pig Roasts, Birthday parties, family reunions, post wedding and funeral parties and a good time was always had by all. He had a very strong faith and lived a Christian life every day. Going to church on Sunday was a ritual which he enjoyed and no matter if the family was away skiing, driving cross-country or traveling abroad, a church would be found and mass would be a part of every weekend (no ifs, and or buts about it!). Barry was Assistant Superintendent of the Three Village School District for instructional services until his retirement in 1992. He was passionate about education and worked with the highest level of integrity and energy on behalf of the students for over 20 years with the district earning a Blue Ribbon School status during his tenure. Barry was an outdoor enthusiast and an avid traveler. He traveled to all seven continents and almost every U.S. State. Some highlights of his travels were his trip across country post the Coast Guard with his best friend Pete Hoban (except for the part where Pete totaled the car by hitting a horse); waterskiing in Sao Paolo with Heather; cross-country summer RV trip with the family to visit the National Parks; safaris in Africa and a cruise in an icebreaker ship to Antarctica with Heather and Marni. When not traveling the seven seas, he could be found telling jokes while watching the sunset with a sundowner at the Old Field Club surrounded by friends and family or at home watching the boats go by in the Long Island Sound. His children learned from his example of how to be a loving spouse, an engaged parent and an active positive member of the community. Volunteering was part of his DNA and he continued to be an active volunteer until his death. Although shocked by his death, his family is grateful to have had so many happy and fun years with him and his legacy will live on in his children, grandchildren and friends. The Ministry for Hope Inc.